Pure Almond Castile Soap for everyday use as a body wash, facial cleanser, shampoo, shaving lather, and dental wash. Also excellent as a mild laundary detergent. 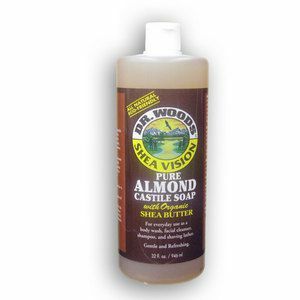 Dr. Woods Pure Almond Castile Soap incorporates the natural healing properties of olive oil with a refreshing almond scent to attract and hold moisture close to the skin and form a breatheable layer preventing the loss of that moisture. It is naturally therapeutic and will leave skin unbelievably soft, clean. Ingredients: Saponified Coconut, Hemp & Olive oils with retained Glycerin, Vitamin E oil, Rosemary extract and Almond oil.